GOLDEN, Colo. – Six inches. Or less. That’s how far quarterback Blake Barney’s outstretched hand holding the football was away from a touchdown to give the Trailblazers the lead in their road game against Colorado Mines. Instead of a touchdown, the ball was jarred loose and the Orediggers recovered the fumble. Even though there was still more than eight minutes remaining, the Trailblazers would not see the ball again, going down 19-17. Barney had driven the Blazers 67 yards and had a first-and-goal at the CSM 10-yard line. On the read-option, Barney faked the handoff and cut to his left. He got hit and spun at the 5. As he came out of his spin he dove and held the ball out attempting to score the touchdown. The ball was knocked back and Colorado Mines took over at the 10-yard line. The Dixie defense held and forced a three-and-out. But the Oredigger punt shanked right and hit an unaware Dixie State blocker at midfield. CSM jumped on the loose ball and once again took possession. From that point on, CSM just milked the clock, getting 3 and 4 yards on every down. They forced the Trailblazers to use their remaining timeouts and took a knee on the final plays to end the game. The home team scored in the first quarter on its first possession. Quarterback Ben Bottlinger’s pass to wide receiver Brody Oliver from 12-yards out culminated a 65-yard drive with 12:36 remaining in the first quarter. The Dixie State offense did not get a scoring drive until late in the first. Starting quarterback Malik Watson drove the team 60 yards before stalling at the CSM 19-yard line. Blazer kicker A.J. Yergensen’s attempt from 36 yards was good, pulling DSU to within 7-3. That would be the score at halftime with both teams playing good defense. The Orediggers matched DSU’s field goal on their first possession after the break. Grayson Harris scored it from 38-yards out. On Dixie State’s next possession, wildcat quarterback Barney replaced Watson. Barney drove the team 69 yards, ending with a 1-yard dive by running back Landon Cook. With 3:08 remaining in the third, the score was tied 10-10. CSM rebounded immediately, scoring on its next possession. On second-and-10, Cameron Mayberry took the handoff and ran 31 yards. However, the crucial extra point failed and the lead was 16-10 with 1:30 left in the third. On the first play of the fourth quarter, Dixie State took its first and only lead of the game. From the CSM 38-yard line, Barney faked a bubble pass, dropped back and found Brad Duran on a post pattern. Duran was actually caught at the 5-yard line, but had enough power to finish the play for a touchdown. Dixie State got the go-ahead PAT from A.J. Yergensen. With 14:47 remaining in the game, the Blazers led 17-16. Once again, the Orediggers answered quickly. The drive would stall at the DSU 15, but Harris’ field goal from 32 yards was good and the score swung back in CSM’s favor, 19-17. That led to the final offensive drive by the Trailblazers that fell short – six inches or less. It was a quirky game for DSU as the Blazers were outgained 262 to 71 yards on the ground, but held an advantage in the passing game 215-168. Individually for the Blazers, Barney completed 8 of 9 passes for 128 yards and a touchdown. Watson completed 9-18 passes. Orlando Wallace had nine catches for 105 yards. Barney also led the team with 35 yards rushing. Defensively, linebacker Noe Perez led the team with 15 tackles. Mike Jones was just behind with 13. The Orediggers were led by running back Mayberry, who had 217 rushing yards on 25 carries, nearly nine yards per attempt. 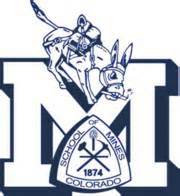 Colorado Mines evens its record with the home win at 4-4. 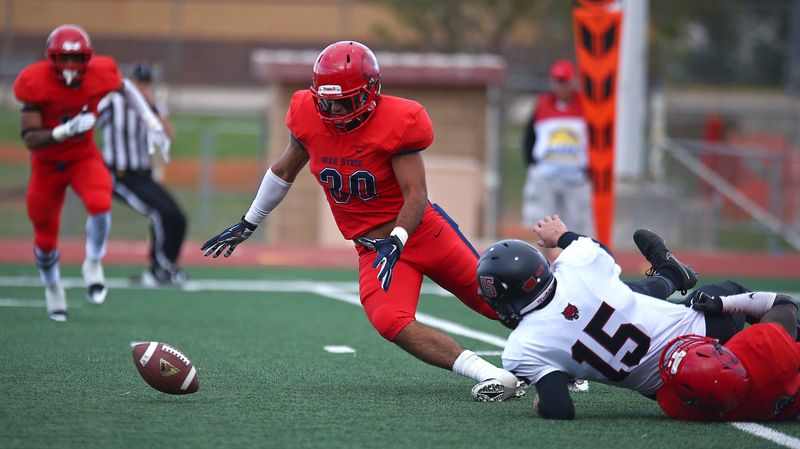 Dixie State falls to 3-5 overall and 3-4 in the RMAC. Next week, the Blazers return home to face Adam State for Homecoming at Legend Solar Stadium. Game time is scheduled for 1 p.m.